Though not yet officially recognized as a medical condition in the Diagnostic and Statistical Manual of Mental Disorders (DSM-IV), exercise addiction can have pervasive harmful effects and there is help for overcoming it. If you or a loved one suffer from an addiction to exercise, we can help you find a treatment facility. You can call our confidential hotline at 1-888-319-2606 Who Answers? . An effective treatment program can help addicts peel back the layers until they get to the heart of their problems. An official definition of exercise addiction is still under development. The cause of exercise addiction varies. It is thought that people become addicted to the euphoria caused when endorphins are released by the body during high levels of physical activity. This creates a positive feedback loop that is believed to be at the heart of the addiction. However, exercise addiction may be a symptom of an eating disorder. For example, some who binge eat may use exercise to counteract the effects of binging.. It is estimated that about 25% of people with either an eating disorder or an exercise addiction also have both conditions. Cultural emphasis on body weight and tone appears also to drive exercise addiction. Some, too, may have other issues in which obsessive or compulsive symptoms are problematic and seep into exercise routines. Addictions have many layers. An effective treatment program can help addicts get to the heart of their problems, to understand the causes and to find successful ways to resolve those issues. 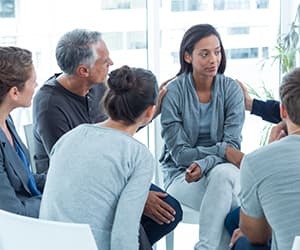 While an exercise addiction can be treated with outpatient services, inpatient treatment programs are often more effective since there is greater structure and support during treatment. An inpatient program allows intensive monitoring and intervention in daily behaviors that contribute to an exercise addiction. Once you have a general idea of what you want, use the resources at your disposal to find treatment facilities that will provide it. You can get recommendations from family and friends, mental health professionals and even the Internet. Do not hesitate to call our hotline at 1-888-319-2606 Who Answers? . With access to information about thousands of exercise rehab centers across the nation, our counselors can answer your questions about treatment programs and help you find the best one for you. Like many other addictions, exercise addiction can be overcome. The right program coupled with a determination to beat the addiction can lead to a healthy relationship with exercise. To find an inpatient exercise recovery center near you, call our national hotline at 1-888-319-2606 Who Answers? .